Today’s workload-intensive business applications are often constrained by the performance limitations of their existing hard disk drives (HDDs). With this type of storage infrastructure already in place, many businesses have not previously been able to adopt higher performing solid state drives (SSDs) as a full array of SSD’s is too costly despite the significant IOPs benefit. Now, it is possible to accelerate the performance of existing HDD arrays without making substantial investments in new hardware by deploying SSD Cache with LSI MegaRAID CacheCade technology. 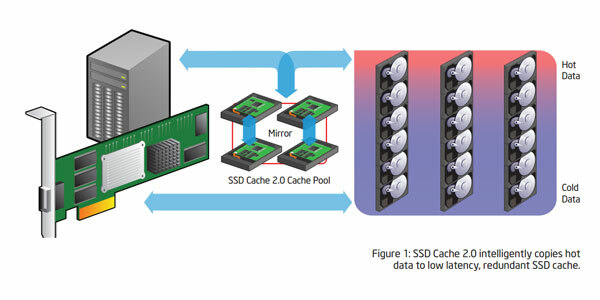 SSD Cache leverages SSDs in front of HDD volumes to create high-capacity, high performance controller cache pools. Intel® RAID SSD Cache 2.0 with LSI MegaRAID CacheCade Pro 2.0 read/write caching technology eliminates the need for manually configured hybrid arrays by intelligently and dynamically managing frequently-accessed data and copying it from hard disk drive (HDD) volumes to a higher performance layer of SSD cache (see figure 1). Copying the most accessed data (‘hot spot’) to flash cache relieves the primary HDD array from time-consuming transactions which allows for more efficient hard disk operation, reduced latency, and accelerated read and write speeds. This provides significant improvements to overall system performance – two to twelve times that of HDD-only configurations – for a wide variety of server applications including web, file, online transaction processing (OLTP) database, data mining and other transaction-intensive applications. The Intel® RAID Feature SSD FastPath* I/O allows users to take advantage of significant performance enhancements while generating a higher ROI for SSDs. This feature offers two distinct usage models for server systems with one or more solid-state drives (SSD). The first usage model is to use SSDs as extended cache for an array of conventional hard drives. The second usage module is using FastPath I/O to accelerate I/O performance of a complete SSD array through the enablement of algorithms optimized for flash-based storage. Workload-intensive business applications are often constrained by the performance limitations of their existing hard disk drives (HDDs). With this type of storage infrastructure already in place, many businesses have not previously been able to adopt higher performing SSDs as a full array of SSD’s is too costly despite the significant IOPs benefit. Accelerate the performance of existing HDD arrays without making substantial investments in new hardware by deploying SSD cache with LSI MegaRAID CacheCade* technology. SSD cache leverages SSDs in front of HDD volumes to create high-capacity, high-performance controller cache pools. Intel® RAID SSD Cache 2.0 offers the perfect combination of HDD capacity and SSD speed. The integrated CacheCade Pro 2.0 technology is designed to improve the performance of a server’s existing drive volume(s) by, dynamically utilizing SSDs as a dedicated pool of RAID controller cache to maximize random read and write performance. SSD Cache 2.0 allows for taking advantage of SSD without manual storage management and in-house application tuning costs, of full arrays of SSD. This lowers the total cost of storage ownership for datacenters and small-to-medium businesses. Intel® RAID SSD Cache with CacheCade Pro 2.0 technology is the industry’s first software solution that offers both read and write controller-based caching on SSDs, dramatically enhancing the performance gains achieved by the previous generation CacheCade software. 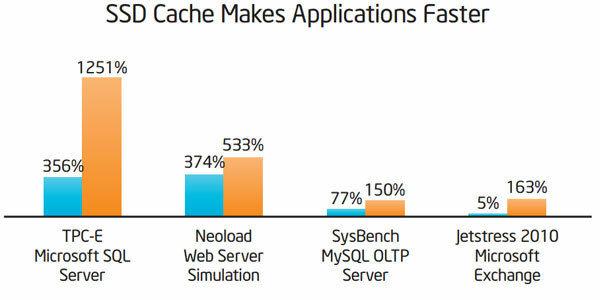 With the addition of write caching support, read/write-intensive workloads such as Exchange server, high performance computing (HPC) applications, Web 2.0 and other IOintensive online transaction processing (OLTP) database system workloads, experience dramatic performance improvements. 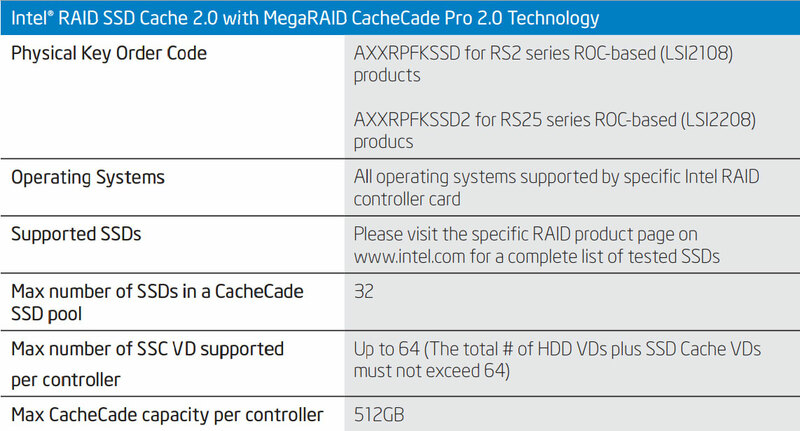 Intel® RAID SSD Cache 2.0 with LSI MegaRAID CacheCade Pro* 2.0 read and write caching technology eliminates the need for manually configured hybrid arrays by intelligently and dynamically managing frequently-accessed data and copying it from HDD volumes to a higher performance layer of SSD cache. Copying the most accessed data (hot spot) to flash cache relieves the primary HDD array from time-consuming transactions, which allows for more efficient hard disk operation, reduced latency, and accelerated read and write speeds. This provides significant improvements to overall system performance—two-to-twelve times that of HDD-only configurations—for a wide variety of server applications, including Web, file, online transaction processing (OLTP) database, data mining, and other transaction-intensive applications. FastPath I/O increases standard transactional performance or application workloads by up to 200 percent as it operates as a high-performance I/O accelerator for SSD arrays connected to an Intel® RAID Controller. This advanced software can dramatically boost storage subsystem and overall application performance—particularly those that demonstrate high random read and write operation workloads—when deployed with a 6 Gb/s Intel RAID Controller connected to SSDs. Application workloads that will benefit most, from FastPath I/O with SSD volumes, are those with small and random I/O patterns requiring high transactional throughput, such as OLTP.